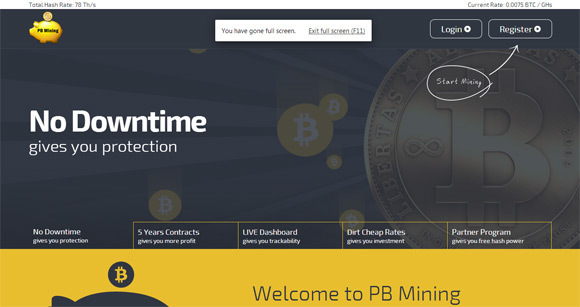 We have started testing the PBMining Bitcoin cloud mining service about 4 months ago and it has been operating for about 5 months in total so far. We were a bit skeptical at first with the operations behind the service willing to stay more anonymous and with the fact that the service offers 5 year Bitcoin cloud mining contracts for a price that is really very attractive as compared to other services that sell you cloud mining hashrate for a period of just 1 year and for higher price. But now, a few months later we can say that we are really happy with the service and this is probably the only such service we have tried so far that hasn’t had any problems after using it for so long. Furthermore the service does continue to update their prices bringing them down with each difficulty readjustment, so if you buy hashrate over time such as reinvesting some of your mined earnings you will get it at a better price later on to compensate for the increase in difficulty. Back in February, when we have started testing and using the service they’ve had just about 14.4 THS worth of hashrate to sell and at the moment their website shows that the total hashrate has increased up to about 829 THS. The price per 1 GHS of cloud mining hashrate back then was 0.0107 BTC and at the moment you can purchase it for 0.0036 BTC. 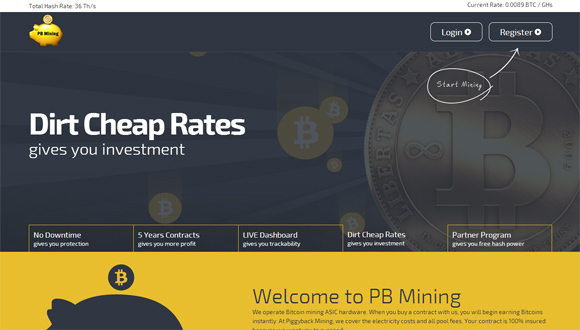 So if you are looking for Bitcoin cloud mining service to try we can recommend to give this one a go, though as usual we do advice to start with just a few GHS to try it out and then decide if it seems trustworthy enough to invest in more hashrate. What could be improved from our point of view is the fact that the service does a weekly payout of your earnings, it would’ve been better if that was a daily instead of weekly one, especially if you have a lot of hashrate. Though weekly payments are still Ok for smaller hashrate contracts and we have never had a problem with the payments. 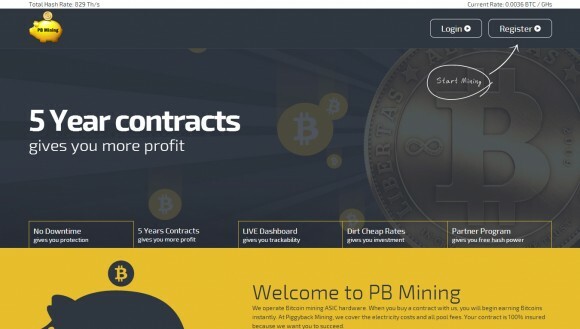 Today the Bitcoin cloud mining service PB Mining has updated their website, something that they have previously announced. Earlier today there was a message about the update pointing to the new IP address of the website, though some of you might still see that message until the DNS cache is refreshed. The new website is not a complete makeover, but more like adding new features and improvements to the interface of the service. We are happy to see that some of the things that we did not like about it initially are now fixed, such as the ability to update your Bitcoin payment wallet address. There is now more clearly structured and detailed information about your cloud hashrate and when your cloud mining contract expires and so on. There could be a few more issues n the next days that need to be worked on, but hopefully things will be back to normal and the support of the service is working to bring everything back to normal after the update. We’ve been testing the service for a month already and though we had some concerns when we first started, now we can say that most of them are gone. The service has been running stable and problem free and we were getting our mined coins each week on time. We are still not ready to invest a lot of coins in the service as we are still testing it, but we are gradually adding more hashrate pretty much each week or when the difficulty has increased. The reason or that is the decrease in price per GHS that the service has with each difficulty adjustment to the already most attractive price they have for cloud mining. At the moment they have 78 THS worth of hashrate and the option to buy a contract at 0.0075 BTC per GHS currently says that it has all been sold out. This however can be a result of temporary disabling the option to purchase new hashrate until everything is operating normally after the move, the same can also be true about new registrations. If you are already using the service and are having some issues try contacting the support or post in the dedicated thread about the service on Bitcointalk linked below. One more week has passed from our ongoing PB Mining Bitcoin cloud mining service tests and yesterday we have received our payout. As we’ve already discussed the service is sending the payouts from the cloud mining hashrate that you have purchased every Sunday before Midnight. From what we are seeing so far the payout seems to be fixed based on the current difficulty and the hashrate you have purchased. So far we haven’t had any issues with the service, unlike many other similar services that do have problems lately, but we are still a bit wary and are not investing too much coins in hashrate. We already have 20 GHS purchased worth of hashrate and we are probably going to be upping that hashrate some more after the next Bitcoin difficulty adjustment in about 8 days, because PB Mining is decreasing their price per GHS with every difficulty increase. And for the moment they are still offering the best price per GHS for cloud mining hashrate that starts mining for you right away. The total hashrate of the service that is being officially reported is now 64 THS. There seem to be already about 4000 people that have registered and are using the service for cloud mining and while there are still some concerns about it, things seem to be running smoothly so far. And even though we have been testing the service for more than 3 weeks already and are so far happy with the results, we do still recommend some caution and to start small and not rush in with a lot of BTC to invest in cloud mining hashrate if you do wan to test it yourself.